I forget what week I am on, but it is probably best not to know! I feel I'm making decent progress on my list, although this could be due to picking some of the easier projects to be getting on with! I will add some more this week in all probability, so time to nick be inspired by some other people's clever ideas! I am currently working on a blanket for a friend's new baby, the pattern taken from moogly's blackberry salad stripe blanket on Ravelry. Lovely easy pattern which rather than doing in the cotton suggested, I'm doing in good old Stylecraft acrylic for ease of washing and drying (a big consideration when you have a small babe and two other littlies.) It's a fairly slow make, not sure why, but I should be finished by mid-week and then onto the next thing! 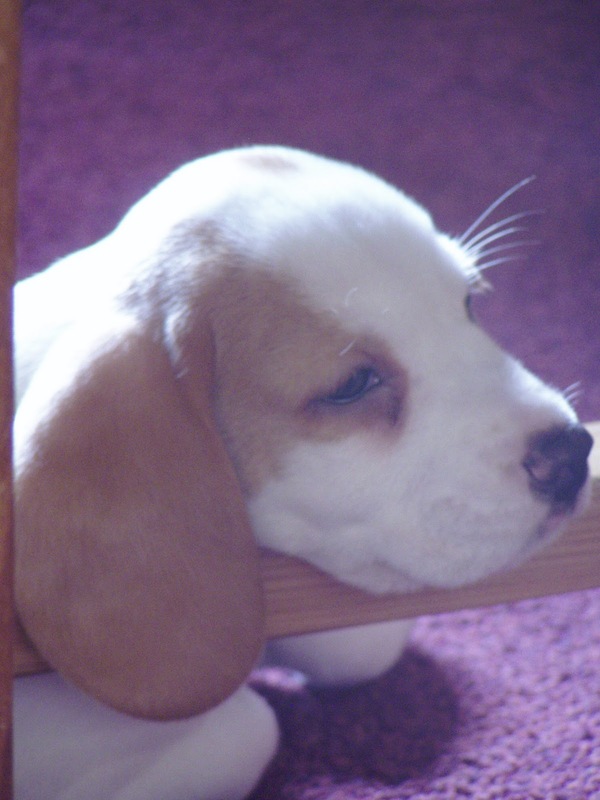 On the pup front, said Puppy now has a name very fitting to the handsome young beagle he is. On the suggestion of Grateful 4 crochet he is going to be called Chester. Apparently when hubby was a little lad he, and a friend's dog Chester, were a mischievous duo, so Chester it is then! It's funny how a lot of you suggested things we had on our list, but just couldn't all agree on. Anyway, back to YOP work, to see other fellow blogger's progress, please see here. Love the blanket and the colours are yum, how right you are with the acrylic over cotton, nothing worse than a blanket taking forever especially when you need it...oh how cute is Chester, can we please have more photos, he's gorgeous. The blanket looks great so far, and Chester is adorable! Look at Chester's puppy-dog eyes! Gorgeous. I love that blanket. I can see that acrylic would be a far more practical laundry choice, but I can't help thinking that it would also look fantastic in the cotton Lang Tissa that I'm using for my Babette. It is lovely though, great combination of colour and texture. I'm still sorry that you won't help me out with the limpets and urchins blanket ;-), but have to say that it doesn't matter if a project is easy or hard, it's still a project. Cute pattern - I bet the baby's going to love grabbing hold of those "blackberries" and tugging at them. Looks like good physical and visua; stimulation! No apologies needed for acrylic - there's a lot to be said for ease of washing and drying! The colours are gorgeous! Funny. The Goatmother and Goatfather had a 'Chester' that they loved. A good and fitting name, if you ask me. The blanket looks great and you have a lot more done than the last picture! You are quite amazingly fast at that, even though you say it is 'slow'! Chester is a lovely name for him, I like it very much :) That blanket looks amazing with all the bobbliness!! I want to make one!! Chester is gorgeous and what a wonderful name. The baby blanket looks a real stunner and I'm looking forward to seeing the finished pic. Chester is such a cutie - I bet he's a bundle of fun. He's too cute! And your blanket is beyond impressive. This blanket is stunning. I love it!!! The blanket is gorgeous--and your little Chester is adorable! Wonderful blanket, wonderful name for the pup! Good luck on all your projects. I think Chester is a perfect name for your pooch! So cute. The blanket is wonderful. Your friend will love it. I love the blackberry salad binky. And Chester? Adorable! I ADORE that pattern and may have just queued it - I have stylecraft left from my granny blanket - but it's not going to do much for my own YoP list, now is it?! That is such as awesome start to that blanket. Lucky bebe who receives that. How fun it looks and the texture is amazing. Gosh, what an adorable pup. Oh your puppy is so cute, I just want to hug him. Chester is a brilliant name. What a great texture on the blanket you're making, what stitch is it?... and as always I adore your colour combo... so cheerful and bright. I Cannot wait to see it it finished. I'm sure it will be well loved! Thank you for your encouragement on my cushion... I am hoping to hone my sewing skills this year (esp in patchwork).... blimey my list of 'things to get better at' is too long, lol. 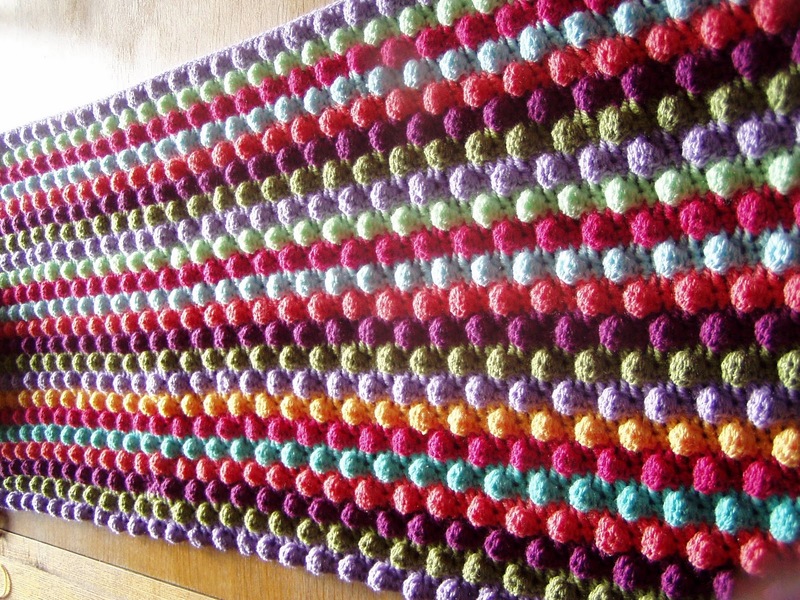 Loving the blanket, fabulous colours and lovely pattern - it must be eating yarn up like no-one's business! Also, Chester is perfect, he looks like a Chester. Thanks for keeping popping by my blog and for taking time to comment. You know, I didn't realise I wasn't following you already, but I have corrected that now! Good luck with the Beagle. We have one and they can be trouble. Benji is a loving beautiful dog but he doesn't like being on his own and he gets jealous! We have to put him in a kennel when we go out because he destroys everything. We used to have a beautiful garden but he dug all the plants up from the roots and ate them. If we play with my son and he thinks we should be playing with him he will get one of my sons toys and destroy it. Saying that he is very loving and you will often find him and my son curled up together on the couch. My hubby likes him because he is great to play with (and tease) and no matter how long a walk he is taken on he will keep going. 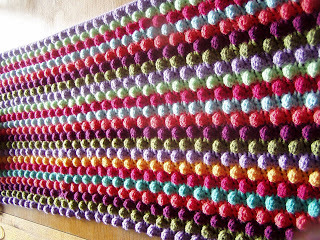 Great pattern for the blanket. Wow, the blanket looks beautiful (and complex)! And Oscar sends his regards to Chester!